The library, in its current location, was built in 1954 as part of the new Senior House building. With its bow front and nine windows running along three sides of the room, it is a bright, airy space ideally suited to its use. At that time Fr. Candon ran the library which was for senior boys only; juniors had their own library in the study hall. One of the major purchases at that time was a set of Encyclopaedia Britannica which is still in use today. The College Annual of 1955 tells us that it is the opinion of the Librarian that ‘the building up of a good library is the work of a lifetime’, it’s not clear if that is the lifetime of the librarian or the school, in any case we are still building on those foundations today. Over the intervening years, the library has seen some changes and yet it still remains the same quiet space. In the mid 60s the room was used as a study hall for the seniors but in 1968 this stopped when a very large oak table was purchased to accommodate the Board of Governor’s meetings. Today we have pushed this to the bottom of the room and our six new PCs sit on it. The space in the centre is now a reading area complete with soft chairs and coffee table. In the 70s Fr. O’Donovan took over from Fr. Candon and introduced classical music to the library. This is not viable today, personal ipods being more popular, but Christmas carols are played in December during opening hours! Two of our proudest possessions are the statues of ‘The Reading Boy’ - cast in polyester resin with a copper finish and ‘A Boy with a Book’ - cast in stone, by Fr. Henry Flanagan especially for the library. In the 70s the junior and senior libraries were amalgamated and although for tradition we keep the sign on the door saying Senior Library, it is for the use of all students. Indeed, it is used more by the juniors than the seniors. Fr. O’Beirne was now ‘in situ’ and Nuala Hartnett, a professional librarian, was responsible for the cataloguing and classification of the books, following the Dewey Decimal system. The budget was £1000.00 in those days, a not inconsiderable sum and this was further boosted by £200 from the Parent’s Association. Indeed over the years the Parent’s Association has been most supportive of the library and today their annual donation is most generous. Fr. MacCionaoith took over from Fr. O’Beirne in 1989 and introduced magazines to the library. Some of those he choose back then, we still get, including History Ireland and Archaeology Ireland. With Mrs. Hartnett’s departure in 1996, this paved the way for the arrival of Mrs. Roisin Lonergan. Today, some eleven years later, Mrs. Lonergan has made some physical changes to the room but the spirit of Newbridge College library remains the same. To make room for new computer technology, some of the old fixed desks have been removed. With the support of some very dedicated parents the library is now opened (outside of class time) for twenty four hours per week, including lunch-time and after school. Today, members of the teaching staff bring their classes to the library themselves during class time and the library prefects and librarian supervise during lunch-time and after school. 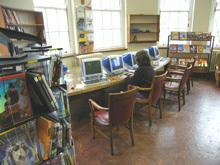 Over all the years the library could not have functioned as it did without the voluntary help of the library prefects. Anyone from 2nd to 6th year can volunteer for this duty. Generally, they volunteer for one day per week, tidying shelves, re-shelving books, labelling and repairing books as necessary and they are always on hand to help juniors with homework or research problems. To all of them over the 53 years the library has been in existence we give our thanks. 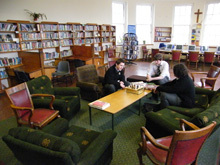 We have chess players in on a regular basis after school and a homework club to help 1st years with their school work. The library is visited by many students after school for a variety of reasons and activities, including: completing their homework before they go home, curling up in our very comfortable armchairs and quietly reading a book or magazine, the occasional quiet sleeper (the sofa is just the right length) and of course, we get the computer users. In a school that houses close to 1000 people every day the library provides a little oasis of peace and quiet, where the ‘no loud talking’ rule is strictly enforced and all can enjoy a comfortable place in which to both learn and relax.